In this seven-day trip, four days of which are painting and quilt workshops, your artwork will be inspired by the beautiful architecture and landscape of Tuscany. The workshop, with morning and afternoon sessions of instruction, lecture and demonstration, will be taught by Esterita Austin an internationally known quilt artist and teacher. The cooking class, which is three mornings, will be taught by the chef at the villa. Each morning starts with a wonderful breakfast featuring a variety of foods and the best cappucino on earth. A buffet lunch is included on the four workshop days and each evening ends with a sumptuous four-course dinner with new friends. For two of the seven days, we will tour the sister cities of Siena and Florence. Siena is the medieval jewel of Tuscany, Florence the cradle of the Renaissance. We will see fabulous ancient architecture and centuries-old art works in two of the most beautiful cities on earth. Whether you choose a workshop in painting and art quilting or cooking you'll be absorbed in creative activities, good company and wonderful food—all in the beautiful environs of our Tuscan villa. Join us for this unique and unforgettable experience, create an art quilt, painting or fabulous meals -and make memories for years to come. To download the enrollment form, click here and return it at your earliest convenience. Quilt maker, designer and teacher, Esterita Austin created "The Well," a prize-winning piece in the American Museum of Folk Art's 2001 international competition "Quilted Constructions: The Spirit of Design." Her pieces have been published in the periodicals Quilting Arts, The Quilters Companion, American Quilter, Quilter's Newsletter, American Style and Distinction Magazine and Folk Art, as well as the books Contemporary Art Quilts and Fiber Arts 7. As an entrepreneur, Esterita has been featured on The Sally Jesse Raphael Show and in the "Threads" section of Newsday. Her work has appeared on the covers of the Indiana Gazette leisure section and the Arts and Lifestyles section of the Times Beacon and Times Record newspapers of Long Island, NY. You can see Esterita give a demonstration of her techniques on HGTV's Simply Quilts with Alex Anderson, segment 1134. On "The Quilt Show" and on Quilting Arts TV. Esterita currently teaches, lectures and shows her work internationally. To see her full calendar and view her work, please visit her Calendar page. Our painting workshop day starts with a drawing class and lesson in watercolor or acrylic paint. Your instructor will make sure you have the foundation you'll need to build your work. The subjects for your studies include the villa, vineyards and olive groves of the beautiful Chianti valley, along with its 13th-Century buildings and the lush gardens of the villa where we will be staying. Painting classes will be taught "en plein air", but some lectures may take place indoors. The Chef will teach authentic Italian dishes in the villa's kitchen. The lessons are served with Italian flavor and humor. The gourmet cooking class is three mornings from 10am-1pm with afternoons free to enjoy the villa. In addition to the glorious days and nights at the villa, we will take two- day excursions by bus. 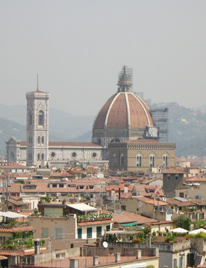 In Florence we will see the famous Ponte Vecchio, Pitti Palace, Piazza della Signoria and the Duomo. In Florence you may choose to spend a morning at The Uffizzi Gallery where you may walk through the rooms and learn about the evolution of Italian art from the 12th Century to the 16th Century. After a leisurely lunch at any of Florence's great restaurants or perhaps a neighborhood trattoria, you are free to explore the great shopping treasures of this wonderful city, which include leather goods, jewelry and clothing. And, of course, a visit to Florence wouldn't be complete without a stop at an outdoor café for an afternoon gelato or a double shot of espresso. We will start off our tour of Siena at the Tower of the city hall where we will will have the choice of viewing the wonderful frescoes and relief work that have survived for centuries. We will then go to the Cathedral, or Duomo, which dominates the profile of the Siena skyline. The Duomo took more than 300 years to complete and is famous for its black and white striated marble. Siena is a glorious medieval city, centered around the famous Piazza del Campo, where the Palio, the famous horse race, is run twice a year, in July and August. The Palio, which means "flag" or "banner," is a race where horses and jockeys from the 17 contradas, or sections of the city, compete in a treacherous three-minute race around the ancient square. Each contrada has a special identity, flag and song. In the afternoon, you may sit in the middle of the Piazza del Campo at the Bar Il Palio with a cafè and just people watch, or perhaps you will want to shop at some of the finer stores in town. The Sienese feel that their dialect is true Italian. Siena is a truly romantic medieval city. Your stay will be at a 13th-Century villa used in the 15th Century by wealthy families from Siena and Florence as a summer residence. The villa sits on top of a hill overlooking vineyards the valley and a lake. You can enjoy this vista clearly from the quilting studio and from the grounds while you work. The villa is on a working farm, where olive oil, wine, Pecorino cheese, fresh vegetables and herbs are grown and harvested. Although it's been updated and modernized, the villa retains its old-world charm. Some apartments have a communal kitchen area, rooms are double, or single occupancy with a private bathroom. All with tradition old world flavor. Breakfast is at 8:00-10:00 and includes a varied menu of freshly baked breads, croissants, cereals, juice, yogurt and fresh eggs from the farm--and of course, cappuccino or espresso is included with breakfast. Lunch is served buffet style in the dining room. Dinner is continental, served at 8 PM. We will spend our leisurely evenings dining by candlelight in the inner courtyard of the villa, weather permitting, or in the medieval dining hall. Six continental breakfasts and seven four-course gourmet dinners. All day excursions by motorcoach/bus to Siena and Florence. Supply lists for the workshop is located on the drop down menu on the Tuscany Link, home page. Lunch on days away from the villa. Download the enrollment form here and return at your earliest convenience. Spaces fill quickly early registration is highly recommended.